As being manufacturer and exporter of the perforated tool board, perforated panel and pegboard, we provide tool holder panels of best quality. These perforated tool boards are perforated on a 32 mm pitch, 15 mm completely edged and reinforced with stiffeners. It provides rigidity to the structure. 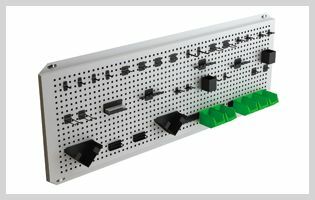 These tool holder panels are help in arrange the tools and inventories with organized manner and make handy on demand. It can be move easily and also hang on the wall. It is multifunctional panel system which helps to organize a multiple tools and inventories of various size, shape and weight on a single surface. This systematic arrangement helps to quickly identify the tools like spanner, files, drivers, cutter, Allen keys, power tools and wrenches. These perforation tool panels contains wide range of hooks for placing tools which is ideally saves the space. These space saving tools storing system also called tool holder panel, tool hanging panel, perforation tool panel, perfo tool board and display tool panel. Perforated panels allow easy overview and access of inventory and tools. Hooks and holder can set as per need without screwing.